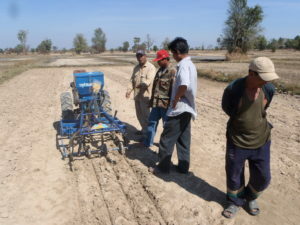 The Crawford Fund is partnering with Dr Leigh Vial, a NSW farmer with experience in Asian farming systems, to encourage individual Australian farmers or groups to provide Lao rice farmers low-cost but well-designed mechanised seeders, which are well-suited to a range of conditions in the small farmer fields in tropical Laos. We are about to place our first order for seeders and to help us with a final push to get us over the line with 10 machines, we are after your help. Any donation will help the cause! “Thus far we have succeeded in attracting enough support for almost ten seeders from our first sponsorship round,” reported Dr Vial. The order for the first group of donated seeders is about to be placed with National Agroindustrial, a farm equipment manufacturer in Punjab, India. 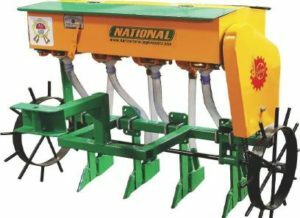 The four-row seeders are capable of seeding a range of crops in a range of situations, and are able to travel easily between fields. We are hoping this final approach will provide additional funding to make the order of 10 machines more comfortably within reach. 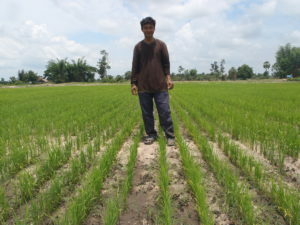 Drill-seeded rice crop, Alan Wattana village.